It’s true what they say, adulthood really does creep up on you. And it can be scary, terrifying even. You’re no longer in school, you’re expected to have or find a job, make enough money to buy a house, have a family, become a real part of the human race and contribute to humanity. Instead, you might find yourself floating around, overly educated, probably without a job, barely enough money to make rent, and the idea of being responsible for a small human being isn’t even on your radar right now. 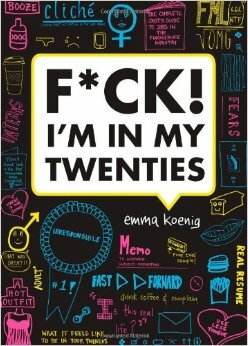 If none of these things apply to you and you’re excelling in your twenties then I congratulate you, but if that’s not the case then you’ll probably find Emma Koenig’s, F*ck! I’m in My Twenties, just as helpful and entertaining as I did. Now, I’ve been an adult for a few years now and it is definitely not what I was expecting when I was a kid. I thought, “I’ll go to high school, then university, get a job, etc., etc.”. Yeah, it doesn’t work like that. Something along those lines? Maybe for some. But I think it’s probably safe to say that your life will not work out exactly how you had planned it. Especially when you’re in your twenties. So when you suddenly find yourself in adulthood-limbo, how do you get yourself out? Unfortunately, I don’t have the answer to this as I’m still in this limbo myself. This book also isn’t going to get you out of this limbo state, however, it does it make it easier to deal with until you can. Using her most popular blog posts as well as a ton of new material, F*ck! I’m in My Twenties, is a fun, new way to look at adulthood. When you read this book it’ll feel like it was written just for you. Talking about relationships (or lack thereof), employment (or lack thereof), or education (which you probably have too much of), there is no other book like this that will explain what being an adult is really like (unless she makes another one which I hope she does). Through graphs, checklists, and illustrations, Emma Koenig took something that everyone experiences and made it entertaining and relatable. Have you read F*ck! I’m in My Twenties? What did you think? ← Six Years of Fanfiction!